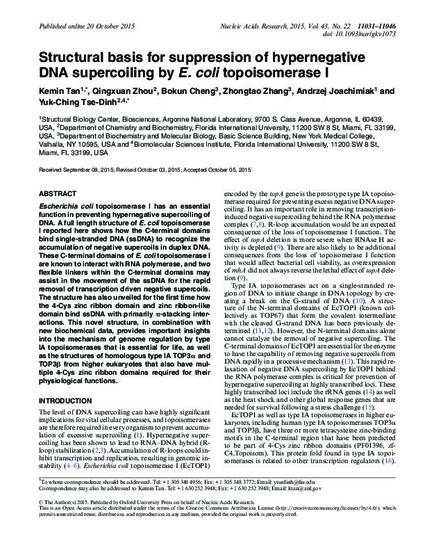 Escherichia coli topoisomerase I has an essential function in preventing hypernegative supercoiling of DNA. A full length structure of E. coli topoisomerase I reported here shows how the C-terminal domains bind single-stranded DNA (ssDNA) to recognize the accumulation of negative supercoils in duplex DNA. These C-terminal domains of E. coli topoisomerase I are known to interact with RNA polymerase, and two flexible linkers within the C-terminal domains may assist in the movement of the ssDNA for the rapid removal of transcription driven negative supercoils. The structure has also unveiled for the first time how the 4-Cys zinc ribbon domain and zinc ribbon-like domain bind ssDNA with primarily π-stacking interactions. This novel structure, in combination with new biochemical data, provides important insights into the mechanism of genome regulation by type IA topoisomerases that is essential for life, as well as the structures of homologous type IA TOP3α and TOP3β from higher eukaryotes that also have multiple 4-Cys zinc ribbon domains required for their physiological functions. Originally published in Nucleic Acids Research.